Al mauto kasun wa kullun, naase shaarebohu"
A year has passed when our Mukaasir ud-Da’wat (ra) passed away from this daar-e-amal to daar-e-ilm leaving behind the memories of those moments that filled our hearts with hidaayat, watered our intellect with ilm-e-haqeeqi, brightened our eyes with baseerat, strengthened us with health and shifaa, and guided us to the path of najaat. He often said that, “The sublime khidmat of Da’wat ul-Haqq is the ultimate service which will help us in acquiring the darajaat here and hereafter.” Huzoor-e-‘Aali Saiyedna saheb (tus) with hudood and mumineen went on the turbat-e-munawwarah of Mukaasir ud-Da’wat (ra) with tearful eyes and hearts full of remembrance of his noble character and ever-helping hands. Mukaasir ud-Da'watil Alaviyah Saiyedi wa Maulaayi Husain Mo'eenuddin Saheb (ra), noor-e-'ayn and chashm-e-baseerat of Huzoor-e-'Aali (tus); and the Saheb of the third rank of Da'wat ul-Alaviyah, ascended from this Daar ul-Fanaa to Daar ul-Baqaa on 13th of Shawwaal 1429 / 12th of October 2008, Sunday in the morning. Huzoor-e-Aali (tus) addressed to the mumineen in the Masjid un-Nooraani before the Namaaz of Janaazah and said that, "The death of a son in front of his father breaks his support and embitters his life. Life and death is in the hands of Allaah Ta'aala. This is the day of Sadmah and Gham for all Alavi mumineen." He added that may Allaah give us Sabr (patience) in the absence of Mukaasir Saheb. No sorrow and grief of this World is greater than that of Imaam Husain (as) and Ahl ul-Bayt (as). It is the blessing of Allaah on us that we are their followers. He said that, 'O mumineen, whenever you find yourself sunk in the grief and sorrow of this world, remember the grief of Imaam Husain (as) and Allaah will give Sabr to you.' Huzoor-e-Aali (tus) then did the du'a for Mukaasir Saheb (ra) that Allaah will give him the reward of his Khidmat of Da'wat and mumineen. 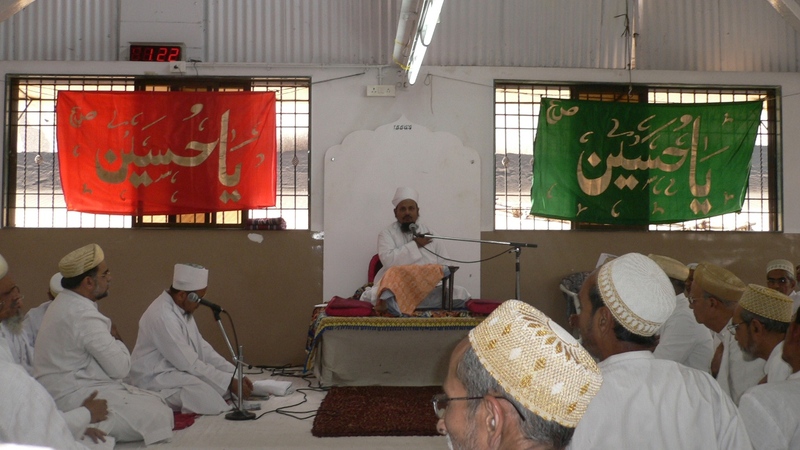 Ek faqat naam-e-Husain ibn-e-'Ali reh jaayega"
Mukasir Saheb did the Khidmat of Ramazaaniyah and Husainiyah in Mumbai for almost 18 years and the mumineen of Mumbai were under his shadow of Shafqat (kindness) and Ulfat (compassion). With the Blessings of Allaah Ta'aala and Du'a of Huzoor-e-Aali (tus), he did the Roohani and Jismaani khidmat of mumineen by leading them in all religious obligations and serving them as a helpful and benevolent Doctor in their physical illnesses. Allaah Ta’aala has ascended few of His close companions (Awliyaa) to a distinguished status and martabah that in their short period of life, they become famous and popular among the people because of their deeds-aamaal. Man is like an animal in his society who, by leading his own life, lives up other’s life and injects warmth and encouragement in them. The Imaan (faith) attains its purpose only when each and every organ of a man works for the cause of humanity; and only then he can reach the purpose of existence in this temporal world to reach the eternal abode. Humble followers of the religion of Allaah are not the ones who only spend their life by offering namaaz, roza and other obligations; or by abstaining from the worldly attraction. But they use their mental and physical capabilities in doing lawful deeds and serving for the sake of society and mankind. They are the ones who have a broad vision and plan the things which are necessary for the growth and progress of their family, society and community. They work for the coming generations so that they do not face any difficulties and keep on reaping fruits of their hard efforts. Allaah Ta’aala remembers these men in the Qur’an and praises them for their life succeeded by service and devotion. These are the people who devote their life for the sake of others and vows to serve not for the self but for their needy and destitute; and they tread their path to reach their goal going through the roughness of hardships. It is their path which serves as a source of encouragement for others. Mukaasir ud-Da’watil Alaviyah Saiyedi Husain Mo’eenuddin Saheb (ra) was one among those men who devoted his life in the way of Allaah and for the sake of mumineen in particular and society in general. He was like a blooming flower in the garden of Da’wat which kept imparting beauty and fragrance to it. 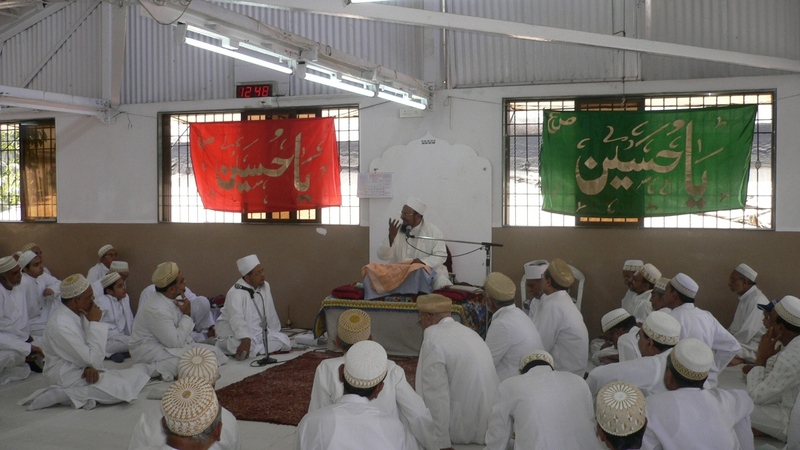 He lived all the obligations of the martabah of Mukaasir very well for a short span of 16 years in Mumbai. With the blessings of Allaah Ta’aala and du’a of Huzoor-e-‘Aali (tus) he not only did the khidmat of Ramazaaniyah and Husainiyah but being a doctor (Laparoscopic Surgeon) by profession he extended his helpful hand, benevolence and kindness to the needy mumineen of Mumbai. He was Mukaasir ud-Da’watil Alaviyah in the eyes of mumineen as far as their Deeni Umoor (religious obligations) were concerned and simultaneously he was a generous, humble and kind human being and a doctor in the eyes of mumineen in their physical illnesses. Allaah Ta’aala has distinguished his status and martabah with his Khidmat of Da’wat and Khidmat of Khalq. 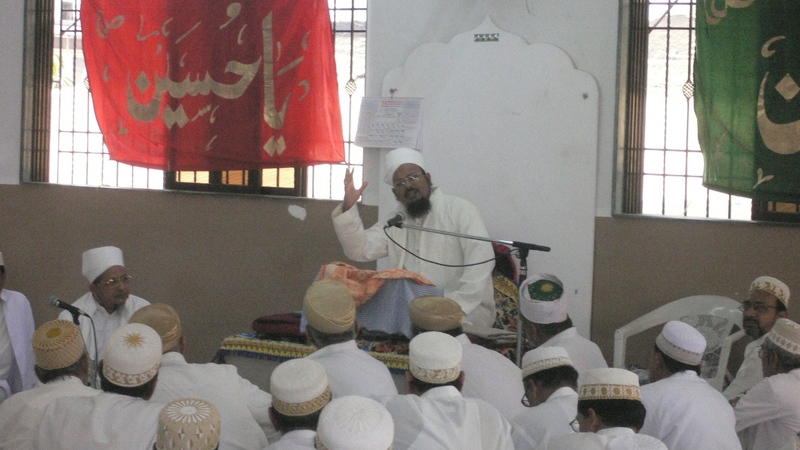 Mukaasir Saheb (dm) settled in Mumbai 20 years back. Initial days of his profession were full of hard work. But gradually as time passed, he got experience in his field and was successful in establishing his consultation in famous hospitals. Soon he gained fame and popularity as a successful surgeon in the South Mumbai and Mumbai Central area. To our misfortune, such a virtuous person passed away from this world. He is not present in the physical being in front of us but being Mukaasir ud-Da’wat – which is the 9th rank of the Hudood of Da’wat-e-Alaviyah, the Arwaah (pl of rooh – soul) of all the mumineen are ultimately associated with this rank and rests in him. Each and every rank of Hudood of Da’wat-e-Alaviyah is Jannat bil Quwwah (inherent Jannat) for the mumineen in this world. Rasoolullaah (saws) has said that, ‘Ambiyaa, Awsiyaa, Awliyaa, A’immat or the subordinates and companions of them are confronted with the endless difficulties and hardships in this world.’ Higher is the rank of the Hudood of Da’wat-e-Alaviyah, greater and harder are the difficulties on it. All Ambiyaa (as) like Moosa (as), Nooh (as), Isaa (as), Yahyaa (as), Zakariyah (as), Aiyoob (as), Saaleh (as) and Yoosuf (as) were tested by Allaah Ta’aala in their respective times and their followers were disobedient to them. They were harassed by their people and were forced upon to leave the religion of Allaah; they were compelled to leave their homes but in spite of all the hardships they kept patience and continued to promulgate the message of Allaah and warned about the fate of their wrong deeds. Ambiyaa (as) never complained about their sufferings to Allaah because they knew that they were glorified at the highest rank of the Hudood of Da’wat-e-Alaviyah and so they will have to endure all the adversities. Allaah Ta’aala says in the Qur’an for Rasoolullaah (saws) in Surat ul- Fatah that, ‘O Rasoolullaah (saws) we have pardoned all your sins – of the past and the future, we have completed our favours on you and we have given the Hidaayat (guidance) of Siraat-e-Mustaqeem to you.' In spite of this, the adversities and difficulties for Rasoolullaah (saws) were manifolds as compared to other Ambiyaa (as). The cause of the death of Rasoolullaah (saws) was the food which was poisoned by a Jewish woman in the Battle of Khaybar. Maulaana Ali (as) was martyred in the Masjid of Koofa with a poisoned sword by Abd ur-Rehmaan bin Muljim (la) – he was innocent. Imaam Hasan (as) was poisoned by Ja’daah bin Ashash by the order of Mo’aaviyah (la) – even he was innocent. Imaam Husain (as) was martyred in hunger and thirst in Karbala by Shimr zil-Jaushan (la) – he too was innocent. Imaam Aamir (as) was also martyred in Yaman. Saiyedna Ali bin Ibraahim as-Shaheed (aq) also embraced martyrdom. In short, the Hudood of Da’wat-e-Alaviyah which starts from Nabiyullaah (as) and ends at Mukaasir, bears and tolerates the hardships for the mumineen, for the sake of their redemption and salvation. Some of them suffers from mental illnesses or has to tolerate the harassment and disobedience of the followers or suffers from a physical illness which becomes the cause of death. This is a perpetual cycle as decreed by Allaah till the day of Qayaamat and this will remain unchanged. Death is a reality. It is a means or way for us which takes us from one destiny to the other; from one world to the other. Death is the end of the physical worldly life and the beginning of the spiritual eternal life. Allaah Ta’aala said to Rasoolullaah (saws), ‘O my Rasool, death will come to you and to the people as well.’ Even if they have hid themselves in a closed metal room, they won’t be spared of death. Fir’aun – the enemy of Moosa (as) proclaimed that he is the one who gives life and death – and declared himself to be God. Moosa (as) witnessed his wrong deeds and kept patience. Allaah Ta’aala said to Moosa (as), ‘O Moosa (as), don’t get disappointed, keep patience because everything has a rise and fall.’ Moosa (as) remained isolated for 40 years. Fir’aun and his army followed Moosa (as) and Banu Isra’eel (people of Isra’eel) to kill him and while they were crossing river Nile, the army and Fir’aun drowned in the waters of Nile. Shaddaad made Jannat and proclaimed that it is more beautiful than the Jannat of Allaah Ta’aala, mentioned in the Qur’an. His newly constructed Jannat was a matter of pride and fame for him. When the construction was complete, thousands of people gathered to see Shaddaad and his Jannat. But Allaah Ta’aala had something else decreed for him. Neither he was able to enter his Jannat nor was he able to see it as the moment he advanced his step in its door, he died. The Fire of Hell was ready for him. Abu Jahal, Abu Lahab, ‘Utbah and Shaibah met with the same fate and tasted the Fire of Hell in the Hereafter. At the time of the death of Mo’aaviyah, the word Kaafir was clearly seen on his forehead. All the enemies of the Ambiyaa, Awsiyaa and A’immat (as) met with the same fate in the end and became the dwellers of the Hell. Death is the cause of the ascension of the deeds of the mumineen in the Hudood of Da’wat-e-Alaviyah. For the mumineen, death is Rehmat and Blessing in this world because it is the means of attainment of Maghferat and Najaat. Death of a learned man is the death of the whole universe. Saiyedna Qaazi No’maan bin Mohammad (aq) has accounted numerous Riwaayaat from Ahl ul-Bayt (as) regarding death and its circumstances. For the Shi’a of Maulaana Ali (as) and the Azaadar of Imaam Husain (as), death causes no grief or sadness but with the Noor of Walaayat, Allaah Ta’aala has eased the suffering of death for us. Two angels – Mubashshir and Basheer will come near to a mumin at the time of his death. The doors of Jannat will be open for the mumin. Remembering death is a good deed and keeping patience in the physical illness is the cause of reward after death. Copyright © 2009 Alavibohra.org. All rights reserved.